Marvel’s latest superhero movie, Ant-Man, is very well made. It has some good action and a few really clever bits. There are some funny parts, along with some not-that-funny parts. This movie pretty much gets the job done. But it’s not particularly memorable, or especially amazing. In a sense, Ant-Man shows how far superhero films have come. If this story, about an ex-con who inherits a suit that lets him shrink and talk to ants, had come out seven or eight years ago, it might have felt like a bigger deal. The main thing Ant-Man has going for it is that it’s pretty well made and avoids a lot of the pitfalls of the previous generation of superhero films. But now, after over 100 superhero movies—including a recent blitz of four or five big ones per year in the United States alone—Ant-Man feels merely pretty good. There’s nothing, in particular, to recommend this movie over the dozens of others you could watch. And superhero movies have developed and innovated, to the point where something merely competent no longer feels like a major achievement. In Ant-Man, Paul Rudd plays Scott Lang, who’s just gotten out of prison and is trying to go straight. But then he gets a chance to do One Last Job, and that brings him into the orbit of Hank Pym (Michael Douglas), an elderly inventor who designed a shape-changing suit and a method of communicating with ants. With the ability to shrink to the size of an ant, and to control ants using pheromones, Scott becomes Ant-Man. But now he has to prevent Pym’s former mentee Darren Cross (Corey Stoll) from misusing Pym’s technology. But the emotional heart of the movie is structured around two father-daughter stories. Scott Lang has a young daughter, but his ex-wife doesn’t let him visit her since he just got out of prison, and Scott has to prove himself as a father. Meanwhile, Hank Pym has a strained relationship with his daughter Hope (Evangeline Lilly) who’s been distant from her father since her mother Janet Van Dyne died. And here’s the problem—the movie really wants us to care about these two father-daughter relationships, but isn’t really willing to do the heavy lifting to make that happen. The “ex con wants to reconnect with his daughter” storyline gets gestured at, but we never really feel Scott’s tortured love for his little girl. It’s mostly conveyed in shorthand, because the movie knows we’ve seen that story before, so it can just give us the Cliff Notes version. Meanwhile, the relationship between Hank and Hope is even sketchier, and at no point do they feel like father and daughter, estranged or otherwise. At this point, you’re probably saying, “Why do I care if this movie has an emotional core? Or characters with inner lives, or whatever?” Which is a reasonable point—you’re going to this movie to see a guy in a fancy motorcycle suit shrink and then use his proportional mass and strength to punch regular-size people on the face. And on that front, the movie pretty much delivers. There’s lots of shape-changing and punching, and it’s fun to watch. But the father-daughter story is apparently the thing that’s supposed to elevate this above being a by-the-numbers superhero origin story, and it’s just not there. And that brings us to the other problem—some of the humor in this film really depends on us being invested in the characters, to a degree that the film doesn’t earn. Basically, this film is a comedy, and it’s funny about half the time. When it plays with shape-changing gags, or the problems of an ex-con trying to hold his job at Baskin Robbins, or some neat tweaks on the “heist movie” tropes, it’s mostly funny. There are a few really inspired running gags in the film. But when Ant-Man tries to do character-based humor, the lack of actual characters gets in the way. Another problem: The film’s villain, Darren, is kind of a non-entity, although he does get one or two good scenes. Don’t get me wrong—I enjoyed Ant-Man for what it was. It’s a fun enough movie, with solid pacing, and some cool moments. It’s just the least memorable superhero movie I’ve seen in quite some time. Blame Marvel: The past seven or eight years of Marvel films have generally expanded the scope of the genre, mostly for good and occasionally for ill. And in the process, they’ve raised the standard for everybody. A film like Ant-Man feels like an unambitious throwback. That said, Ant-Man does have some characters who stick in your mind and win your heart: the ants. The ants pretty much steal this film, even as they help Paul Rudd to steal the McGuffin from the McGuffin factory. The character design of the small army of ants who accompany Ant-Man on his missions is an amazing triumph, and they really feel like they have personalities and life to them. The film does an admirable job of showing us the different kinds of ants that Scott works with, including bullet ants and crazy ants, and making us appreciate their formic adorableness. 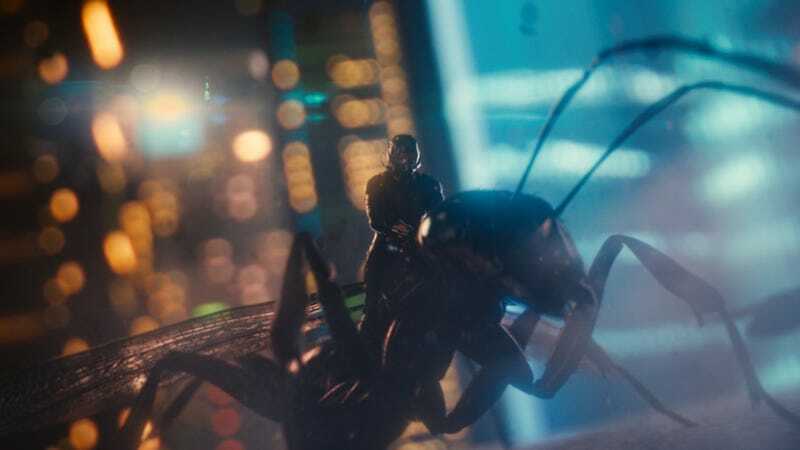 Also, the most memorable action in the film involves the ants doing cool coordinated stunts to help Ant-Man out of some tough situation or another. Along with a few bravura scenes of Ant-Man growing and shrinking and using his variable size to get the drop on people, the ants are the main thing that’s visually unique and cool about this film. All Ant-Man needed was more work on the characters and the main relationships, and you could have had something special. As it is, though, “superhero origin story that’s also a heist movie” feels like a mash-up of two overused genres, not something new and fresh in its own right. The result is a pretty good movie, but not something that’s going to stick with me.